OMP400 compact high accuracy touch probe – Ultra compact high-accuracy 3D measurement touch probe for small to medium sized machining centres. The OMP400 is an ultra compact probe, ideally suited to small to medium machining centres. It combines the miniaturisation of the highly successful OMP40 probe with new advances in strain gauge technology, pioneered by Renishaw’s high accuracy MP700 probe. Strain gauges attached to the structure measure the smallest of stylus motions, allowing for a very sensitive system. 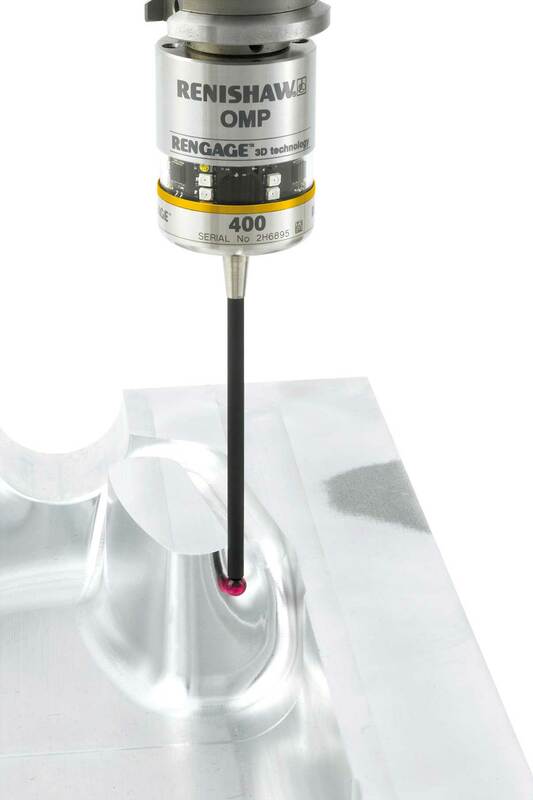 The innovative RENGAGE™ technology built into the OMP400 brings unrivalled performance in terms of 3D measurement. Use OMP400 with Renishaw OMV for advanced on-machine verification when machining contoured surfaces and complex shapes. Patented RENGAGE™ technology brings unrivalled performance in terms of 3D measurement.